helps to reduce bad cholesterol as well as prevent cardiovascular disease and lots more. Many recipes can be prepared using this millet. Particularly this millet is used in powder form, means the ragi flour. 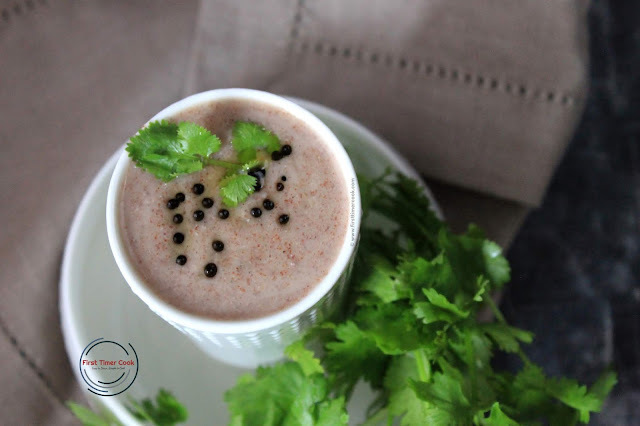 Here I have come up with a salty drink using this healthy millet flour as 'Salty Ragi Malt'. The whole process is so simple and hardly it takes few minutes to complete. The buttermilk is added here to adjust the consistency of the drink. If you want you can go with normal water as well. I have used some homemade buttermilk just by mixing curd and water in 1:2 ratio. 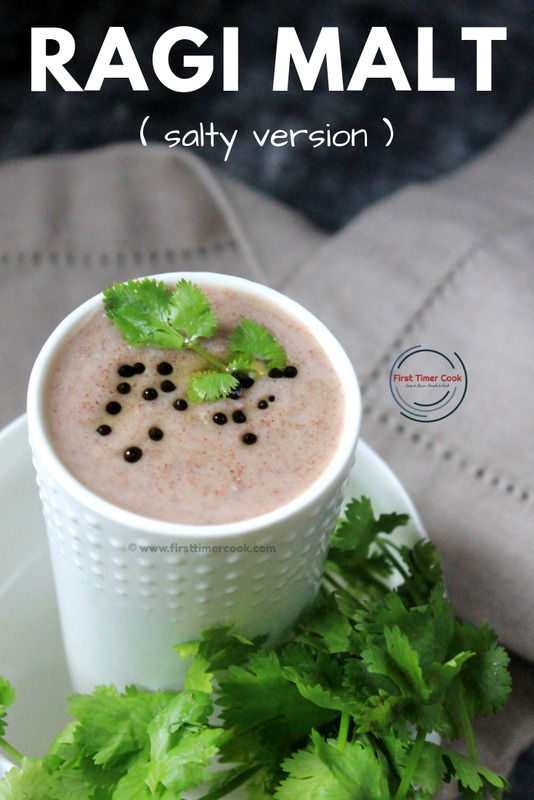 This salty drink is an amazingly healthy and nutritious choice for people of all age group. If trying for babies, then the seasoning part has to be omitted. In a saucepan, first mix the ragi flour and water till no lumps are there. Then cook the ragi mixture for 3-4 minutes. When the mixture is heated, it always starts to form lumps immediately, so its always important to keep stirring the mixture continuously. Then turn off heat and allow the whole mixture to cool down completely. Next add the buttermilk, salt and mix till everything incorporated well. Now heat oil in a tadka pan. Add hing, mustard seed and allow to splutter. Pour this seasoning over the ragi mixture. Also add some finely chopped coriander leaves. I don't prefer to add coriander leaves here, so I have not added. Mix everything well and adjust the consistency of the whole drink by adding more or less water / buttermilk. 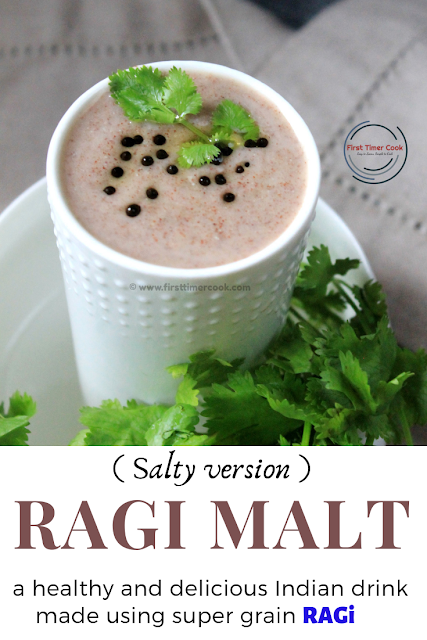 Serve this salted ragi malt chilled or as it is ! Here i have used homemade buttermilk. Just in a bowl, mix curd and water in 1:2 ratio until smooth. And the buttermilk is ready. Few curry leaves can be added to the seasoning. This 'Ragi Malt (salty version)' is contributed for 53th Healthy Wellthy Cuisines where the theme is 'Ragi Fest at HW'. Here are more similar recipes shared by our Healthy Wealthy Group members as Ragi Halbai, Ragi wheat snackers, Ragi Dates Laddu, Chutney stuffed ragi idli, Ragi Pakoda. Healthy share Sasmita ! 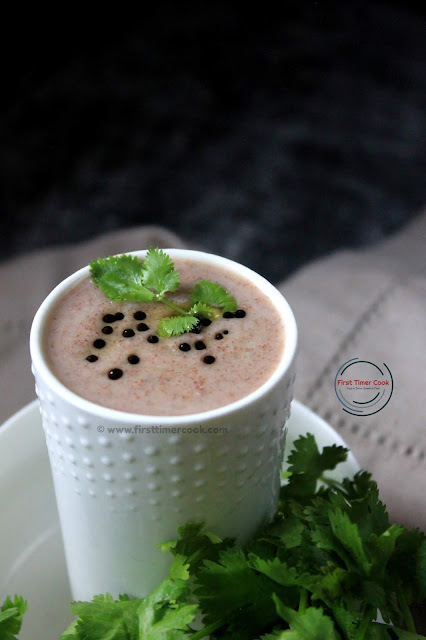 Love the earthy flavor of Ragi. One of my favorite drinks, but it is sweet!! Must try this salty version!!! Yummy and healthy! I have never tried this recipe. i will give this recipe a try very soon. Beautiful presentation. Being a Kannadiga, Ragi Malt is a drink I grew up drinking almost everyday. A staple in most of our families. This salted version sounds so lip smacking,will definitely try it. Love this healthy share Sasmita! Ragi is my favorite grain. I have never tried making malt out of it. Looks delicious. ragi malt look delicious, though I never had it. It is very nutritious drink and if anyone who loves is surely benefited. I got my workaround to eat ragi. This is so filling and looks delicious. We usually have the sweet version - ragi kanji. This is a perfect breakfast grab and go! Wow! Quite a healthy drink. I must include in my diet. Thanks for sharing.